Until about age two and a half, my twins did everything together. They actually preferred it that way and had a bit of separation anxiety when we first started getting alone time with each twin. They still prefer to do things together, especially now that they are in different classes for preschool. I like the alone time with each of them and sneak it in when I can so I can get to know their individual personalities even more. This may shock you but I don’t wake my twins up at the same time in the morning. I wake one up first for five minutes of snuggles with mommy. Once their little love meter is full, I wake up the next one with their snuggle time. We all start our day off with smiles and warm hugs this way, and no one is fighting for mommy’s attention when they open their eyes. 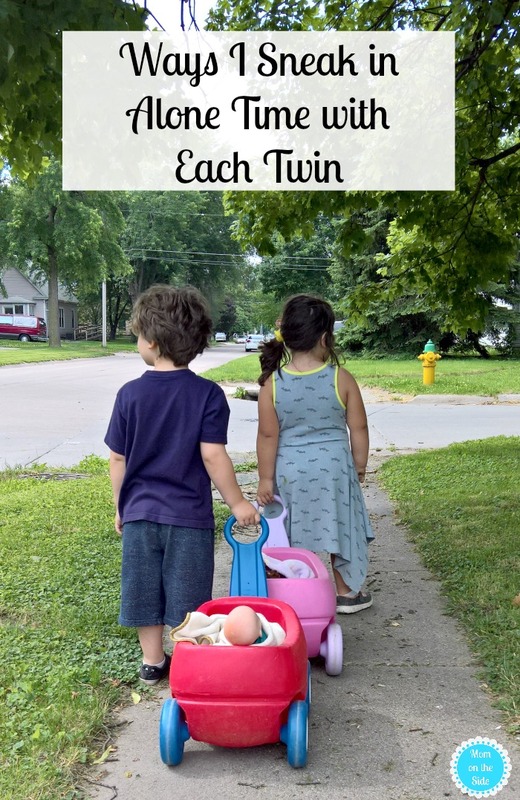 Paying attention to the different interests of each child lets me sneak in some alone time with each twin. Setting aside even 10 minutes to enjoy the activities they love, individually, makes them smile big. Charlie Sue loves to wash dishes and will spend time at the sink with mommy. Oliver loves to dance and continued classes even after his twin sister stopped going. Driving to dance on Saturday mornings is one of my favorite times with him, and the donuts afterward. Having boy girl twins, they don’t always need a haircut at the same time. I take advantage of that by making haircut time alone time. Our salon has a basket of kids books so we show up a little early for our appointment and sit to read a few. Afterwards, we stop for ice cream which I’m pretty sure their favorite part. Once a month all of our kids get an individual date with mommy or daddy. Sometimes it’s a movie or trip to the park, other times it is lunch at a restaurant or shopping. A nice little time to reconnect with child and focus some attention on only them, which is nice when you have three siblings. How do you sneak in alone time with each twin?